This recipe for Slow Cooker Honey Garlic Chicken Thighs is an easy, kid-friendly weeknight dinner. 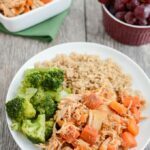 Let the crockpot do all the work and serve with rice and steamed veggies for a balanced meal. Chop the sweet potato and carrots to roughly the same size pieces and place in the bottom of the slow cooker. Pour over chicken and cook in a slow cooker on low for about 6 hours.